Bremerhaven has approximately 118,000 inhabitants and lies 60 km north of the City of Bremen and 90 km west of Hamburg on the North Sea. Ships, ports, locks, seagulls and lots of fresh air give Bremerhaven its special character, making this coastal city a very authentic location for studying Cruise Tourism Management. Historically, Bremerhaven was one of the biggest European emigration ports, from which over 7 million people left the Old World to set sail towards the United States of America between 1830 and 1974. However, some also travelled in the opposite direction: In 1958 Elvis Presley disembarked in Bremerhaven to start his military service in Germany. Life by the water and with the water has shaped Bremerhaven's main tourist attractions: the German Emigration Centre, the "Klimahaus", the German Shipping Mueum, the sailing event SAIL, a beautiful maritime zoo as well as the Fishing Harbour. Bremerhaven also hosts the internationally renowned Alfred-Wegener-Institute for Polar and Marine Research (AWI). 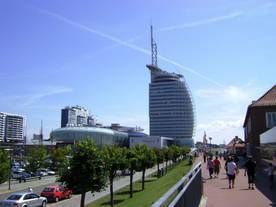 Bremerhaven benefits from moderate living costs. The housing market offers sufficient accommodation. The basic rent is 4 € per square metre. Furnished rooms and small apartments can be had for 120 - 200 €. A limited number of rooms in student halls of residence is also available. Other living costs are also very reasonable and are estimated at about 250 - 350 € per month. 12 km of sandy beaches in Cuxhaven, the famous mud flats of the Wadden Sea National Park, the city of Bremen with its historic centre and UNESCO World Heritage sites, the city of Hamburg, and many beautiful islands can be enjoyed comfortably on day excursions from Bremerhaven. Go to Useful Links to find out more about the nightlife, sports classes and housing in Bremerhaven.